REMEMBERING CLINT MABIE ~ and reflections on risk vs reward. by Mike Toughill | DBP MAGAZINE ONLINE The World's Best Free Whitewater Publication. Family and friends mourn the loss of kayaker Clint Mabie of Hurley, WI. 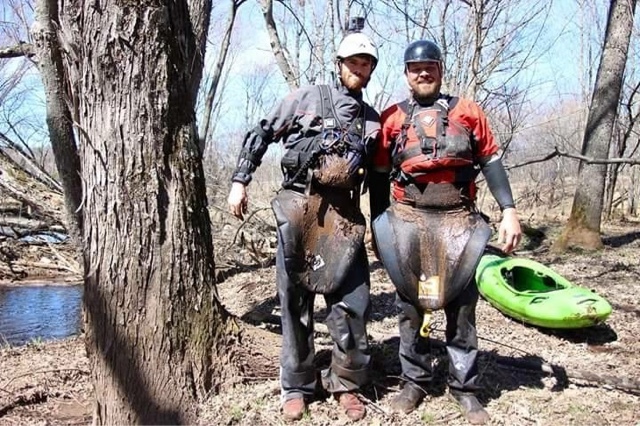 It is believed Clint died of head trauma, on his home stretch of Class V whitewater, the Black River on Saturday April 16th. He was 49 years young, a fixture in the upper Midwest paddling community, well known and loved by his peers, and an expert kayaker. I learned of Clint’s passing while paddling Big Falls of the Jump River on Sunday afternoon with fellow DBP Admin Sam Schank. The circumstances are remarkable, and speak volumes to the small group of people who live in the Northwoods who are drawn to rivers. We met many friendly locals who were fishing and enjoying the park at the Falls, and even some kayakers. We met an older gentleman fishing with his grandson as we were packing up our boats at the day’s end, firing up venison dogs on Sam’s grill. He asked, “Do you know Clint Mabie? He died yesterday.” He was Clint’s uncle, and he told us what he knew of the situation. Sam and I were shocked. We had been talking about the Black in ominous terms throughout the day while we paddled and walked the five minutes from takeout to put-in. Everything up that way is rowdy right now, and that river is rowdiest. It is Aaron Erdrich’ favorite run, his home stretch, and it’s very challenging, and a killer. With the group of dirtbags gathering at Kosir’s Rapid Rafts for Pesh Fest next weekend, we were discussing options, and that usually includes the Black. We also heard three different accounts of recent drownings right here at Big Falls, the rapids we were running, including a tuber who had ignored warnings from one of the guys we spoke to! The locals got a big kick watching us run laps, but as we were told the drownings we couldn’t help but wonder if they were waiting for us to swim. Sam and I discussed risk and reward that day. We talked about why we boat and what we are looking to accomplish. Sam felt that the Black was a bit more risk than he had felt comfortable taking on the last time he had run it, with Aaron. I said that I was scared of it, although I look forward to going. We both agreed that for us, fun means more than rush and we like Class 3 and 4 boating, like we were doing on the Jump. In fact, the Rada Race had been scheduled to go off the day before, and we wondered if it had been too high on the Presque Isle to happen. 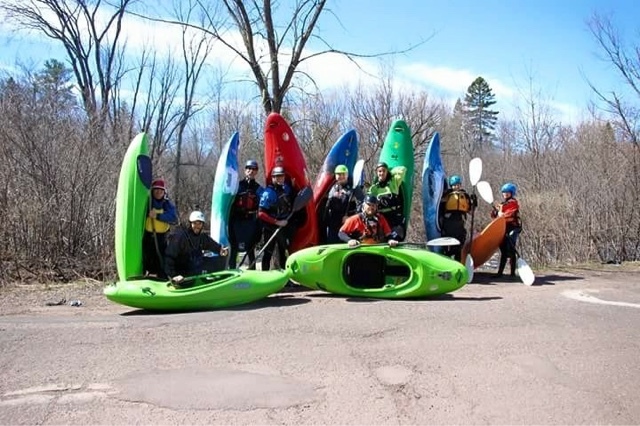 Most if not all other local upper level kayakers have met and befriended Clint over the years, especially at Wausau. DBP Admin Will Heindel said, “I knew Clint quite well. Great guy. Terrible loss.” He will be missed for the joy he brought to the river, and the passion he had for life. Dirt Bag Paddlers will honor Clint by naming this year’s downriver race at Pesh Fest in his honor, and hoisting a jar of shine to sip and pass for a toast to his memory next Saturday night at Rapids Resort. Enjoy the endless whitewater in the heavens till we meet up at the takeout. What we do for fun is by it’s nature very risky. Remember to boat with your soul, not your ego. But things happen, even in the zen moment. There is no way to mitigate the risks or prevent tragedy. It is the nature of paddling. All of us as paddlers are willing to accept that. I suggest that we share that acceptance with our family members, and continue on. Remember to reflect on why it is you really paddle, and what you wanted out of it when you started, when you think of Clint Mabie. If it’s charge hard, go for it! Be safe out there everyone, take care of each other, make careful reasoned choices, and go with the flow. The Mabie family is in our Hearts and Prayers. Clint died on the Narrows Section, Class 3, at very high water, approximately 1300 CFS. Clint and his group knew exactly what they were doing. They were paddling the narrows, which is maybe a class 3 section of the Black river. Clint has paddled this section many time and could probably have paddled with his eyes closed. What happened was totally a random accident. Almost like a car or bike accident. It’s nice that you want to honor Clint. He was not only a great paddler, but an incredible man who unceasingly loved his family, everyone around home and the Lord. Clint lived his life to the fullest and I am sure that if there was one thing he would want risky paddlers or anyone in his life to know is that they should get right with the Lord. Charlie,it's Tarion. The Black is the type of river that could give you a head injury. Big slides and shallow high speeds. Amen. He left a great legacy. Everyone who knew Clint could see how he loved the Lord and his family. The light was always shining through his eyes and heart. Many prayers for his family and friends.